Turf in Pallet quantities of 50 roles per Pallet shipped to your door. Our turf is a medium grade turf with a mixture of amenity turf grasses (listed below), to provide a hard wearing surface of good appearance for domestic gardens, play areas etc. Turf is only cut to order, so please allow a few days (frost permitting), from placing your order. We'll send you a progress email as we process your order. Grasses included: Dwarf Rye Grass, Creeping Red Fescue, Chewing Fescue and Smooth Stalk Meadow Grass. 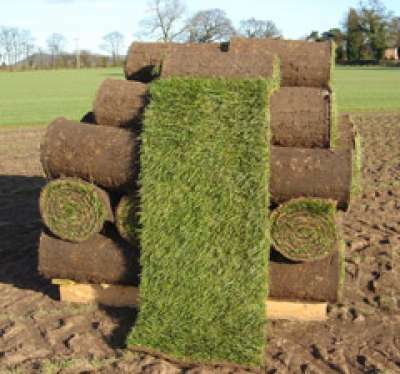 Turf is available for 'NATIONAL DELIVERY' in pallet quantities only. *Single Rolls of Turf (and/or full pallets) are available for 'CLICK & COLLECT' (on Saturdays only). In order to allow enough time for cutting and to ensure availability, Click & Collect orders will need to be placed by the latest 12 noon on a Friday. Thank-you in advance for your co-operation!